Most of us start out with sparkling white teeth, thanks to their porcelain-like enamel surface. Composed of microscopic crystalline rods, tooth enamel is designed to protect the teeth from the effects of chewing, gnashing, trauma and acids caused by sugar and other foods. But over the years enamel is worn down, becoming more transparent and permitting the yellow color of dentin – the tooth’s core material – to show through. Some foods and drinks such as coffee, tea, wine or certain vegetables, tobacco use, poor dental hygiene, illness, some medications and advancing age can all contribute to noticeable tooth discoloration. By making some minor lifestyle changes you may be able to prevent this. For instance, If you’re a smoker or a regular coffee drinker you may consider cutting back on caffeine or tobacco- or quitting altogether. Getting regular dental cleanings by a trained dental professional will also remove surface staining and plaque from accumulating in your teeth and gums dulling your pearly whites. However, for a more drastic, noticeable and quick improvement, an in-office teeth whitening procedure may give you the results you’re looking for. At DentAlign Studio, Dr Scopu uses the latest state of the art teeth whitening procedure with the EZlase™ System. This procedure is one of the most advanced teeth whitening systems available to dental patients. Ezlase™ is an advanced laser technology developed by BIOLASE Technology, the leader in dental lasers for over 20 years. EZLase™ Laser Teeth Whitening is one of the most advanced teeth whitening systems available today. 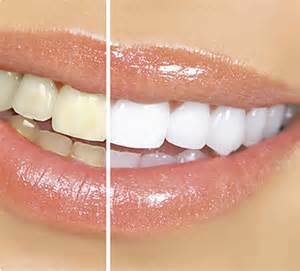 Laser teeth whitening is safer, longer lasting, and can whiten teeth that are severely discolored. This treatment works for patients with difficult to whiten teeth, stained teeth and the most challenging shades to treat: grey and brown. This laser whitening procedure takes less than half the time of other in-office methods and unlike other whitening systems, it does not use UV lights. You are only 20 minutes away from a bright beautiful smile, call our office today for an appointment. Quick Read! What are Veneers? In dentistry, a veneer resembles a wafer-thin piece of material that is placed over the teeth to improve appearance and protect the tooth from becoming worn down. In order to qualify for the placement of Veneers, your dentist first must do an initial consultation and see if you are a candidate. If you are, then the next step is for the dentist to remove .5mm of your tooth surface in order to fit the veneers properly (evenly with your existing teeth). The porcelain veneers shell structure is then bonded to the surface of the teeth. With veneers you have the ability to change their color, shape, size or length to help you get the perfect smile you are looking for. Typically, Veneers are used for treating tooth discoloration, worn down teeth, chipped or broken teeth, misaligned, uneven or irregularly shaped teeth, and teeth with gaps. Porcelain veneers are very sturdy and most importantly very esthetic. They do not stain like your natural teeth or composite (white filling material). Thus, you can keep your smile nice and bright all seasons long. Veneers range in cost, depending on the type of veneers and the experience of the dental technician.. Veneers are a quick, efficient and beautiful way to improve your smile instantly, and never have to worry about imperfections again! If you are interested in more information of a free consultation please contact our office at (718)821-7432 and mention our blog or our facebook when making your appointment.